It’s almost fall in St. Louis, which inevitably means the food and festival fun will be flowing! The Taste of St. Louis will be held October 1-3 in Soldier’s Memorial, with over 45 restaurants representing St. Louis’ culinary spread. In addition to noshes, the Taste of St. Louis hosts live music (including a new blues stage), cooking demonstrations, art and wine walk, a Kids’ Kitchen and stage, and much more. Admission is free all weekend. The Taste of St. Louis is partnering with Metro to encourage people to use public transit to get to the festival. Taste’s location, Soldier’s Memorial, is located at 12th and Market in downtown St. Louis, and is accessible from the Civic Center MetroLink and MetroBus Transit Center, and the 8th & Pine MetroLink Station. 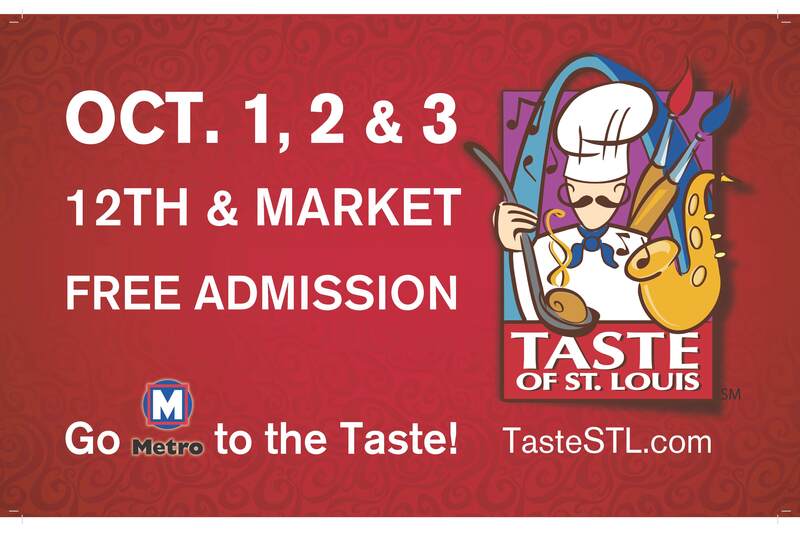 Right now, you can register to win 2 free Metro Day Passes to attend the Taste of St. Louis. All winners will be notified by email. Good luck to all who enter, and we’ll see you at the Taste!